Once again, Glasgow is one of the participating cities and I am one of the volunteers who will be at various locations and events around the city this week. There are a huge variety of events covering all aspects of social media for all sectors of the community. I’m attending a couple of education specific events, including “What’s it all about? Using Social Media” at Glasgow Caledonian on Tuesday morning, and “Education on-line – mini-mooc” on Wednesday morning, where I’ll be part of a panel presenting a variety of view points on online education. My brief is to share some of the work JISC and CETIS have been involved in around curriculum design and course information. As you’d expect, there are lots of ways to participate in all the events via hashtags, live streaming, youtube, flickr, facebook, apps etc. More information is on the main SMW website. For the Glasgow event, here’s a twitter archive (courtesy of Martin Hawksey). 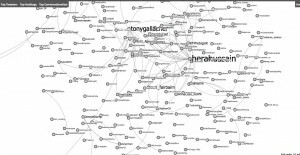 There’s already a bit of activity on around the #smwgla tag. As the week progresses I’ll be sharing and checking out the top conversations using Martin’s tags explorer. Again, using one of Martin’s templates, I’ve pulled together a timeline of videos/images which are using the #smwgla hashtag. I’ll be sharing more of my experiences and thoughts throughout the week via this blog and twitter. 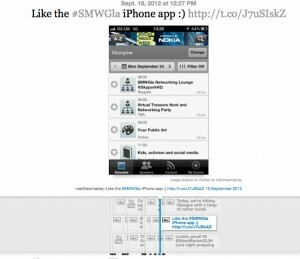 Glasgow is one of the participating cities in the global Social Media Week. I was pleased to be able to attend the Social Media and Academia workshop at Glasgow University earlier this week; organised by Edinburgh Beltane, Beacon for Public Engagement and EDINA. The event generated a really interesting discussion around use of social media from three main perspectives – teaching and learning, the library and community engagement. Nicola Osbourne (@suchprettyeyes) live blogged during the session and her account really captures the varied discussion that took place. The things that struck me most were around the power to use social media to connect (or perhaps) reconnect place and community. Being a bit of a transient soul, I tend to use and think of social networks as virtual space devoid of location. However a sense of place is important for institutions, and it was interesting to hear about the various uses of Facebook within Glasgow University and also the discussion around the dangers of being in too many networks – particularly related to staff time to monitor these networks for any request for information. We also heard form Chris Speed and Peter Matthews about a really fascinating project in Wester Hailes, Edinburgh, were local residents are sharing their memories of places, and place through voice memories via social networks – in this case primarily Facebook. I also found out about how Oxfam are using tagging of objects so you can now trace things you donate and see how much money they have been sold for. There also seems to be a growing recognition in academia of the power of social networks – are we, in Gartner terms, on the slope of enlightenment perhaps? I’ve also pulled together some of the tweets from the session too – which gives more of a twittter stream of conscious feel for the session too. 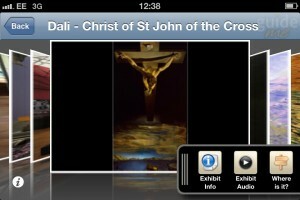 All in all a really thought provoking session which I’m still thinking through. Many thanks to EDINA and Beltane for organising the session and to colleagues at Glasgow Uni for hosting it.